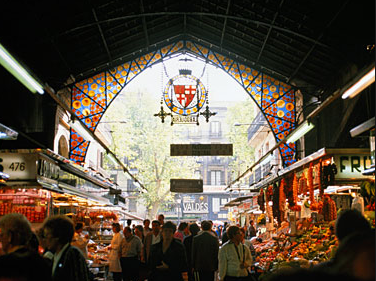 Every neighborhood in Barcelona is blessed with its own market, full of fresh, locally sourced, seasonal produce and real bargains. What better opportunity to interact with the locals and shop like a native. Here is a guide to a few of our favourites. No trip to Barcelona is complete without a visit to one of Europe’s most famous markets – the Mercat de Sant Josep de la Boqueria, or simply “La Boqueria”. Conveniently situation on La Rambla, this energetic market engages every sense. With internationally renowned chefs, including Barcelona’s own Ferran Adrià, amongst its patrons there’s no wonder it has previously been named the world’s best market by the Congress of the World Union of Wholesale Markets. If you would like to sample delicious food straight from the market visit one of the many tapas bars inside. 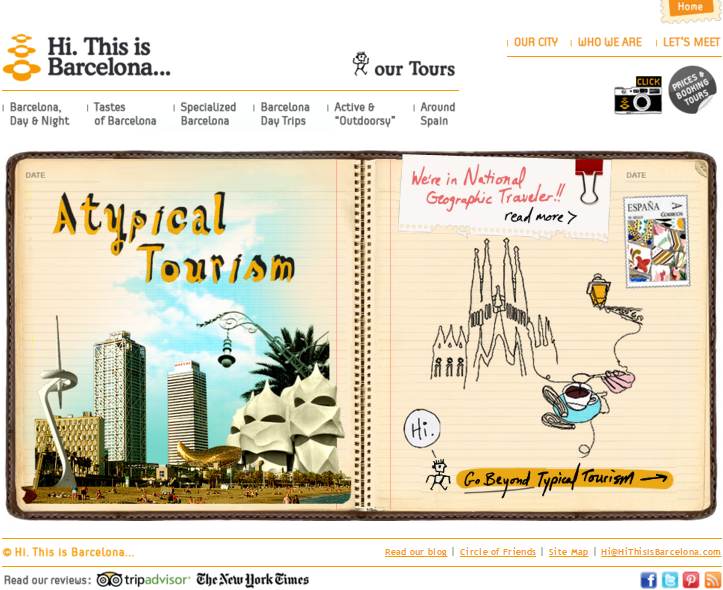 Address: La Rambla 91, 08001, Barcelona. Opening Hours: Monday – Saturday 08:00 – 20:30. Metro: Liceu (L3/Green Line). Just across Via Laietana from Barcelona’s Gothic cathedral, you cannot help but be intrigued by the funky roof of the Santa Caterina market. Originally built in 1845, on the site of a convent bearing the same name, the market underwent a dramatic transformation thanks to a commission awarded to the husband and wife team of Enric Miralles and Benedetta Tagliabue. After shutting its doors for 7 years the market finally emerged like a butterfly from a chrysalis in 2005, resplendent with its new crowning glory. Even if you don’t want to shop it is worth visiting the market just to admire the roof, which is a work of art in itself. Address: Av. Francesc, Cambó, 16, 08003, Barcelona. Opening Hours: Monday 07:30 – 14:00, Tuesdays/Wednesday/Saturday: 07:30 – 15:30, Thursday/Friday: 07:30 – 20.30. Metro: Jaume I (L4/Yellow) or Urquinaona (L4/Yellow and L1/Red). 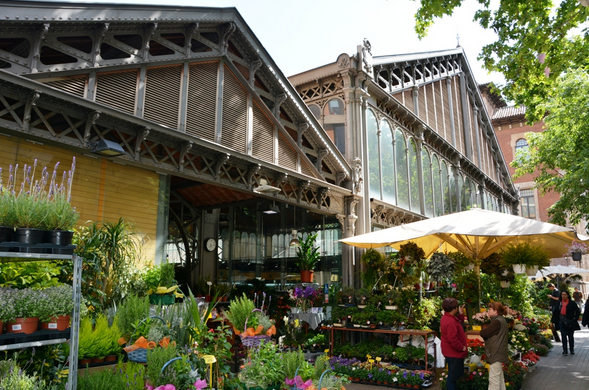 As you approach along Carrer Aragó you will know that you are nearing your destination when you can smell the enticing scent of fresh blooms thanks to the 24 hour flower market that is a feature of Mercat de la Concepció. Designed by Antoni Rovira i Trias, who was responsible for a number of other Barcelona markets, this handsome building first opened in 1888, and was elegantly restored over a century later in 1998. If you are itching for a flea market then head to Encants. 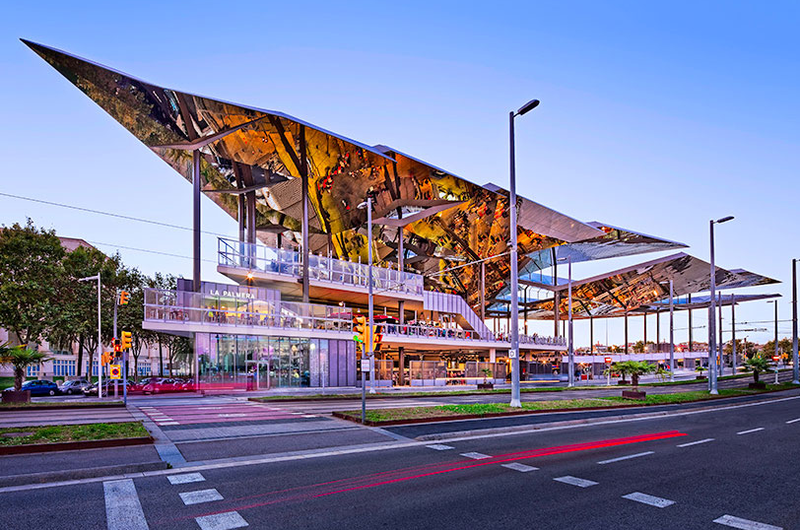 This market has recently moved from just over the street to its current home, and (once again) your eyes cannot help but being drawn to the futuristic, mirrored roof, which floats above the stalls beneath like a scene from Flight of the Navigator! This is the place to come to if you’re seeking one-off bric-a-brac and bargains. Address: Avinguda Meridiana 69, 08018, Barcelona‎. Opening Hours: Monday/Wednesday/Friday/Saturday 09:00 – 20:00. Public Auction: Monday/Wednesday/Friday 08:00 – 09:30. Metro: Glòries (L1/Red) or Encants i Monumental (L2/Purple). Tramvia: Glòries (T4/T5/T6). Although no longer a functioning market, the Mercat del Born’s impressive architecture and historical contents are worthy of a visit. Opened in 1878, this imposing building was also designed by Antoni Rovira I Trias and for nearly a century served as Barcelona’s main wholesale market, closing down in 1971. 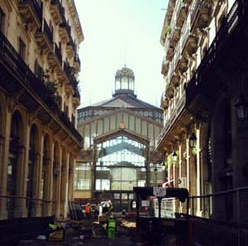 For several decades there was much debate over the future of Mercat del Born, with plans to re-open it either as a market or a library. However the discovery of significant ruins during its renovation lead to the decision to instead convert the it into a visitors center, offering a glimpse early 18th century life and events in the area. Address: Carrer del Comerç, 2, 08003, Barcelona. Opening Hours: Tuesday – Sunday 10:00 – 20:00. Metro: Jaume I (L4/Yellow) or Barceloneta (L4/Yellow). 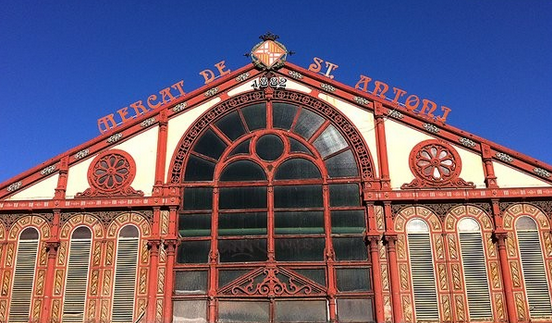 Mercat de Sant Antoni – Closed for Renovation! Another of the prolific Antoni Rovira i Trias’s creations, the Mercat de Sant Antoni was opened in 1882 and is currently undergoing a facelift, so sadly not accessible to the public. However, based on the market’s majestic shell we are very excited at what the future holds. Let’s hope the funding issues, which have plagued its restoration, do not reappear. In the meantime, the stores from the market have been temporarily re-homed to the adjoining Ronda Sant Antoni, and a second-hand book market still operates every Sunday outside of the original market building. Address: Comte d’Urgell 1 (with Ronda Sant Antoni 18), 08011, Barcelona. Opening Hours: Monday – Thursday 07:00 – 14:30 and 17:00 – 20:30, Saturday 07:00 – 20.30. Metro: Sant Antoni (L2/Purple). This entry was posted in Barcelona and around, Food and Drink and tagged Antoni Rovira i Trias, Barcelona, Benedetta Tagliabue, Encants, La Boqueria, La Rambla, La Rambla Barcelona, Mercat de la Concepció, Mercat de Sant Antoni, Mercat de Santa Caterina, Mercat del Born, Spain. Bookmark the permalink. ← Ready for the music? Check out three of Barcelona’s nicest live music venues!